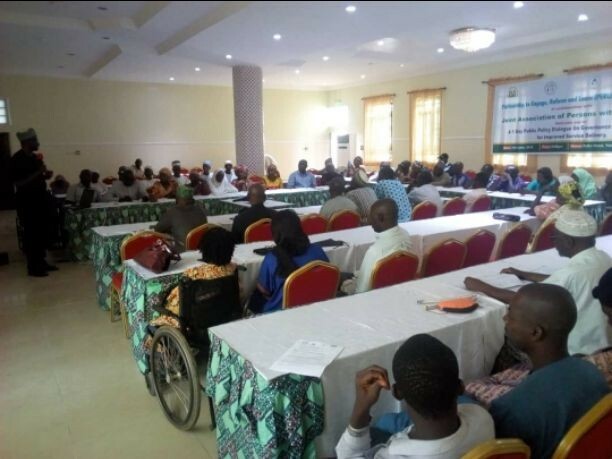 Few hours to his death on Thursday, June 14, 2018, President, Joint National Association of Persons With Disabilities (JONAPWD), Julius Shemang, at a meeting in Kaduna told participants in that meeting that, his leadership initiated and pushing for speedy passage of Kaduna State Disability Bill to give PWDs sense of belonging. Julius, who was billed for an interview by newsmen at the end of one-day public policy dialogue on PWDs on governance and Disability Bill for improved service delivery objectives in Kaduna state facilitated by a non-governmental organisation, Partnership to Engage, Reform and Learn (PERL) had left for the hospital before the end of the meeting and died few hours later. But his vice, Suleiman Abdulazeez further said, JONAPWD was agitating for speedy passage of the bill because it will validate sketchy issues regarding human rights which was not properly addressed by the constitution. According to Suleiman, no single heading that talk about rights for PWDs was captured in the constitution which was why the passage of the bill in Kaduna State was important to them. “That bill contains issues that have to do with our rights. That is why we are pleading with the state government, civil society organisations, media and spirited individuals to come to our aid to actualise this course. “If you look at Nigeria today, even the so called able bodies are not finding things easy let alone of people like us who are living with one disability or the other. “What that is telling us is this, without the passage of this bill, there is little or nothing the government can do to help us collectively”, he said. He however urges PWDs to get knowledge and education because these will help in getting employment in public sphere even if the bill is passed into law by Kaduna State House of Assembly (KSHA). “Without education, you are adding another disability on your disability. Even in this meeting, those you see are those who can bring their expertise to bare to collectively drive this course to a meaningful conclusion and they can’t do that without education”. Acting Director, Kaduna State Rehabilitation Board (KSRB), Aliyu Haruna Yakassai said, the bill was long overdue as there was no legal framework establishing even KSRB quickly added that, there was much more to be done for this category of people than rehabilitation. He said, the international practice now focuses on right issues; whatever is the right of other citizens, PWDs should be able to equally access such rights like education, health and social welfare packages among others. His words, “the bill was initiated by JONAPWD as a private bill. But because of the importance the Kaduna State government attached to the issue of disability, it was forwarded to the state government and the state government agreed to forward it to KSHA as executive bill to give it speedy concern. Also contributing, Principal, Demonstration School for Deaf Children, Kawo, Kaduna, Mrs Adesina Victoria said, “this is the right time to push for the passage of the bill. It will help these category of Nigerians fulfill their potentials in life. It will also help the government to put them into consideration while rehabilitating or building public infrastructures”.